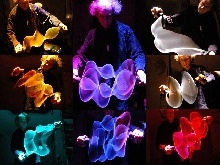 Paul Friedlander has spent more than two decades researching all kinds of technologies and systems in an attempt to turn light into a malleable, flexible material capable of taking on any form and volume. 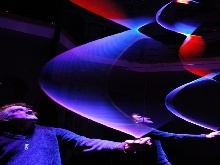 His “kinetic light sculptures” are clearly influenced by the work of other great figures who have preceded him in the art of light or moving structures, from László Moholy-Nagy to Flavin and Turrell. The titles of Friedlander’s kinetic light sculptures are usually references to different aspects of modern science, from quantum physics to string theory. However, both their aesthetic constructs and the way they are received by viewers inevitably contain something of the spiritual and magical. On the 4th of October 1957, Sputnik 1 was launched. I was 6 years old and it was the first piece of news on the TV I truly understood and felt deeply moved about. I was a child of the Space Age and I became fascinated with space travel and everything about space. By the time I was in my teens, along with designing my own interstellar starships, I had a serious interest in astronomy and a love affair with cosmology but my first passion was to prove brief and disappointing because I fell for the wrong theory. At the time two theories were competing and I preferred the Steady State, which proposed an eternal universe with no beginning or end to time. In 1965 the crucial piece of evidence was discovered, the cosmic background radiation, that confirmed the Big Bang and disproved my favourite theory. Since then I have continued to follow cosmology with great interest but always with an eye for how things may be changing and whether any cracks are showing in the winning theory, which I never could feel entirely comfortable about. Over the passing decades, observations have improved immensely and important advances have occurred but nothing has altered the basic picture of expansion being the main way the universe as a whole moves. Nothing at least until now. It is perhaps hard for me to convey the excitement I felt when I first read of the discovery of cosmic spin, I felt like dancing in the street. No, it would not directly undermine the Big Bang, but I sensed right away it certainly would put theorists in the hot seat trying to accommodate it within their ideas. But perhaps I am rushing ahead too fast, let me go back to the beginning of cosmology. The Ancients knew the universe was spinning around the Earth but Copernicus proposed an alternative explanation, the Earth was moving. Today we are certain that Earth's place is not unique, earth like planets could exist all over the universe but a shadow of doubt has crept into the question of whether the universe is spinning. Physicist Professor Michael Longo at the University of Michigan at Ann Arbor had the idea to check and he did this by getting a team of 5 graduate students to look at over 200,000 photos of spiral galaxies. Any astronomer or cosmologist would have told him not to waste his and their time: the number spinning clockwise compared with those spinning anticlockwise should be more or less the same and any variation entirely down to statistical fluctuation. Their confidence is based on the cosmological principle that asserts that on the large scale the universe must be homogeneous and isotropic. 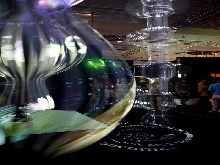 This means that our universe is like a well stirred mixture. If we point a powerful telescope in one direction and photograph distant galaxies and then repeat the procedure looking in the opposite direction, we are looking at two regions perhaps 20 billion light years apart yet they look more or less the same. The shapes and sizes of the galaxies and how far apart they are from their neighbours cannot be distinguished. Observationally it is established beyond doubt that the universe is homogeneous but it not so easy to confirm isotropy, that they have no alignment or preferred direction. Distant galaxies look like very faint misty smudges even in the finest telescopes. Confidence in the cosmological principle arises from a long history of improving observations with ever better telescopes and increasingly good confirmation of just how 'smooth' the universe is when considered on a suitably huge scale. It is recognised that galaxies tend to form into clusters which themselves group into super clusters but this process has an upper bound. There has been no hint that the grouping process continues indefinitely, indeed it is believed to be impossible. The universe was created in a near perfectly smooth well stirred state and there simply has not been enough time since it formed for structures much larger than a few hundred million light years across to have formed. At least that is conventional wisdom. Longo's study already covered a region of space reaching out to 1.2 billion light years, which is larger than the limit to vastness set by the by the cosmological principle and now another researcher, Lior Shamir of the Lawrence Technological University at Southfield, Michigan , has carried out another survey looking at galaxies even further away using a computer to automatically analyse their images. He is also confident there is an overall spin and his results come with 40 fold increased statistical significance. But there is a catch, the axis he finds his galaxies to be aligned along is 70 degrees away from the one that Longo found. What are we to make of this? Are they both completely mistaken? Or perhaps the errors are larger than they realise and the true axis lies somewhere between those reported? Both are possible. In science beautiful ideas have a nasty tendency to fall foul to ugly facts. Before continuing with cosmic spin I want to talk more about the Big Bang. In my mind this was such an ugly fact and now let me explain why. Time having a beginning is only part of the problem. Every known law of physics breaks down at or very close to the moment of creation. The instant of creation is like dividing by zero in arithmetic which is not allowed. Take any number and divide by zero, the answer is always infinite. At time zero many terms go to infinity, temperature, density, etc. Worse still space and time themselves become infinitely distorted and breakdown. What does this mean? No one is quite sure but they have a name for it: a singularity. If an infinity ever crops up in any more routine science, the normal reaction of a scientist is at once to consider the calculations to be invalid. She or he needs to find a different way to do the calculations or it is time to go and make more observations to find out what is really going on. Can cosmology be different to every other science? Space appears to be infinitely large, although we can only observe an infinitesimally small region of this and the Big Bang is full of all kinds of infinities. Are we really just to accept this? I have doubts. Cosmology should be like other sciences where ideas are tested by experiment or observation and up to a point that is what is going on: all the time astronomers improve their observations and cosmologists adjust their theories to agree with those facts. Theoretical physicists studying fundamental forces also have a problem with unwanted infinities, in their case just considering what would happen if you could get really close to a fundamental particle, say an electron, then surely its electric field should increase towards infinity just at this central point. They have long since found a mathematical work around to this problem but the suspicion remains that it is something of a fudge and fundamental particles cannot really be infinitely small and therefore are not truly particles but must have some shape and size. 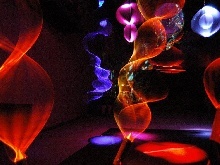 The preferred shape is string like, hence the idea of String Theory. In recent years both cosmologists and physicists studying string theory have been leaning more and more towards the view that there is a multi-verse, a multiplicity of universes. The cosmologists arrived at the idea after concluding that the Big Bang far from being unique is something that is happening all the time and perhaps an infinite number of times but in locations vastly more remote than the furthest galaxy we could ever hope to see. While string theorists got there by a completely different route, they concluded that there appear to be a vast number of possible forms the laws of physics can take and since there was nothing apparently to choose between them, then all these possible laws must be true somewhere in some other universe. They refer to this idea as the Landscape. More cautious physicists are unconvinced by these ideas as it appears problematic to find evidence to support them. Working with mathematics alone has lead science far beyond the point where any evidence might ever be collected to prove these ideas are real. There is no expectation that we will find some science fiction style gateway to the other universes. They remain remote and entirely hypothetical. Theoreticians have gone out on a limb from which they may never return. I would like a new discovery so theory can reconnect with experiment and observation. Cosmic spin just might be just what we need. Nikodem Poplawski of Indiana University at Bloomington has an explanation for the Big Bang with no infinities, the universe is inside a black hole. His universe starts very hot, but not infinitely hot. Likewise all the other infinities are tamed. Lee Smolin of the Perimeter Institute in Ontario proposed that universes might form inside black holes some years ago. Poplawski 's work builds on this idea and he points out that black holes observed by astronomers spin so a universe inside a black hole should also spin. Longo's discovery maybe the first piece of evidence that the universe is inside a black hole. And if it is inside a black hole, then we can be sure at least one other universe exists, the one in which the black hole that formed our universe sits. From that point it might seem reasonable to expect many and possibly an infinite number of universes to exist. I am reminded though of an episode of the cartoon Futurama , set a thousand years in the future, where they go off to visit the restaurant at the end of the universe. A discussion ensues amongst the protagonists about how ancient astronomers once thought there might be an infinite number of universes, but it turned out there were only two, and you could get a fine view of the other one from the restaurant at the end of the universe, another restaurant, looking exactly the same looking back at them, two old time American diners floating in a black void. Even if the universal direction of spin is confirmed there will be an immense amount of further work needed before any apparently crazy notion like living inside a black hole can be confirmed. Perhaps this research will all turn out to be a mirage but alternatively the Spinning Cosmos may come to be seen as the key discovery that marks the beginning of the new physics and cosmology of the 21st century. More and better observations are needed and they are going to come from South America. In several years time, the future Large Synoptic Survey will begin at a new observatory being designed that will be built in Chile. It will eventually image about 10 billion galaxies, around 20 times more than currently known. After first reading about cosmic spin I at once I wrote to Michael Longo and was delighted that he responded positively. I proposed to create a light installation on the theme and he most kindly made available his data, a list of over 25,000 galaxies drawn from the over 200,000 that had been studied. These were the 'hits' that showed a direction of spin in their spiral pattern. This data was extracted from The Sloan Digital Sky Survey. This is an amazing modern day oracle that anyone is free to visit, a website containing data and photographs of millions of galaxies. But like the oracles of old it may be hard to interpret the meaning in its pronouncements. Longo has found a pattern in this vast body of information. I have attempted to give artistic expression to this not by faithfully reproducing the appearance of the sky, but rather by treating this knowledge as a source of inspiration to create my Spinning Cosmos. The galaxy data has been included in the installation along with sculptural ideas, both virtual and real inspired by the discovery . The data is used to draw the positions of all the galaxies in a 3D map and the data, which is all stored as strings of numbers is also displayed 'as is', seemingly endless lists of numbers, catalogue numbers, records of positions in the sky, red shifts, etc. The kind of information that once filled nautical almanacs that real navigators had to read today are now rarely seen as computes process them automatically but I felt it would be appropriate the numbers are put in the installation alongside the galaxies that they are telling us about. For many years my art has involved the use of spinning in creating kinetic sculptures but I never guessed that spinning might turn out to be so important to cosmology and so little understood. Let there be spin!